What Can a Digital X-Ray Tell You that Regular X-Rays Cannot? Digital Motion X-Ray, or DMX, is a technique utilized by physicians during musculoskeletal examinations. This technique involves taking a motion picture x-ray of a person moving naturally. Standard x-rays are done when the patient is stationary, and only contain one frame showing a still of the patient’s skeletal structure and making it possible for physicians to determine where incongruities of the spinal column or other irregularities are within the body. Once the issue is identified and pinpointed, the physician consults with the patient before taking further action to address the issue. With the help of the digital motion x-ray technique, issues can be assessed in a dynamic way, rather than a static one. There is a natural flow to how a patient’s anatomy should move when the body is in alignment and is functioning properly without chronic pain. When the body undergoes a trauma, such as whiplash caused by a car accident, concussion, or neck injury, the digital motion x-ray technique is useful for determining and pinpointing the root cause of the issue that is causing the chronic pain. This diagnostic technique is also referred to in medical journals as videofluoroscopy or cineradiography. By seeing the bones in motion, DMX detects abnormal and excessive movement. Traditional x-rays, MRIs and CT scans do not determine this abnormal motion as they are two-dimensional representations of the skeletal structure without the factors of time and movement. When the ligamentous part of a joint is damaged, weakness, injury, and pain may result. Bone spurs may form around improperly functioning ligaments which hold together muscle and bone. This ligament damage is usually detected by pain, joint swelling, muscle spasms around the joint, and bone spur formation over the longer term. Often surgery is used to remove bone spurs, and cortisone shots to reduce the swelling. However, unless the root cause of the issue is addressed, it is difficult to achieve total relief. First, the patient places his head or neck in position, and while the patient goes through a series of motions, the DMX videotapes the movement of the bones and joints. 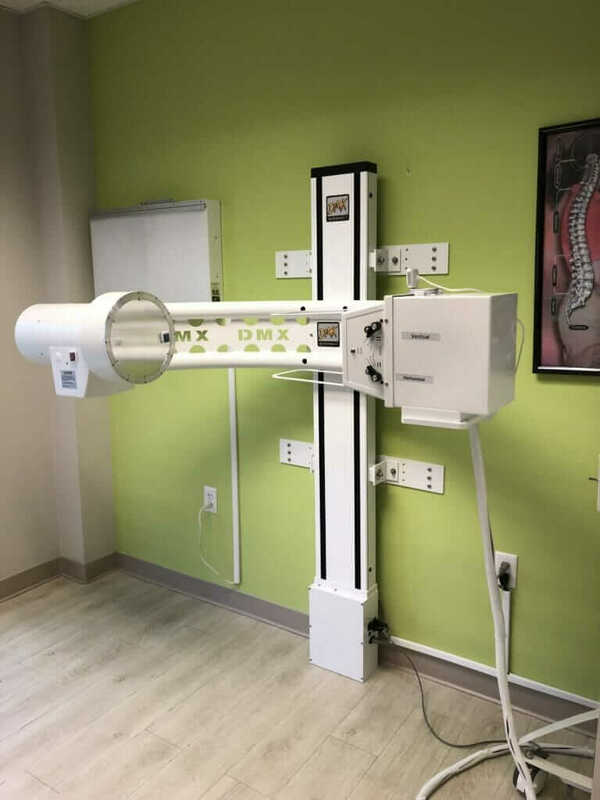 The x-ray camera used for the DMx procedure takes 30 x-ray frames per second, and the subsequent x-rays are digitized and sequenced to create a video representation of bone movement. Additionally, more data can be gained by putting the joint under stress or having the patient hold a weighted object while moving. This can also be achieved by the physician applying passive pressure in the direction of the instability. When the DMX scan is finished, the patient receives a disc with the scan on it post-procedure. A report is then compiled and to you and the referring medical service provider within five business days. A patient’s diagnostic is most helpful in the hands of their service provider, as they know what to look for. Who Can Benefit from Digital X-Rays? Patients who have chronic pain as a result of an accident, such as whiplash from an automobile accident, are recommended to get a DMX scan before simply letting go of their case. A DMX scan is the number one way to document joint instability and is not an experimental procedure. Spinal instability, peripheral joint instabilities, and conditions where chiropractic care may be an option instead of surgery, are all valid reasons for receiving a DMX scan. In some cases, after viewing the results of a DMX scan, physicians will recommend against surgery. This technique is a powerful insight beyond what a simple CT scan, MRI or x-ray can assess, and this may be a way for surgery to be avoided if at all possible.